Description: Empty coal train heads down toward Southern Illinois. 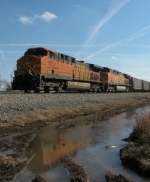 Description: BNSF 5713, GE AC44CW leads an Eastbound coal train at Milford Nebraska. Description: A coal train coasts through Fridley on its way to Northtown Yard with an SD90 and a Dash 9 on the Fourth of July. Description: A coal train, with a nice array of power. The CEFX was pretty neat to see. Description: The DPU's pass the crossing at the south end of the siding. Description: BNSF 5713 leads a empty coal train west through Bristol. Title: Ok yes your looking at it, no it's not an illusion, your staring at EIGHT diesels! Description: BNSF 5713 pulls 5 motors past Railroad Park in Newton. Description: 255 Roadrailer runs through Oakley IL just East of Decatur where it will stop for traffic. Description: BNSF 5713, 7001, 7050, & 4123 lead a long manifest out of the TRRA Madison Yard heading for the K-Line (Hannibal Sub). It will soon cross the Mississippi River and jump on the K-Line. I believe this train was the Dayton, Tx - Galesburg, Ill. train but Im not 100% sure. Title: BNSF 5713 Leaves the trra yard heading for Saint Louis Mo. Description: this train would head to the bnsf k line and go north on the Missouri side. Title: 4 Unit's work a empty ore train NB up the Fort Scott Sub. Description: NB empty ore train with 4 unit's on point and 2 cream n green's.